Tesla is expected to unveil its first 'budget' car at the 2015 Detroit Auto Show. Speaking in an interview with Autobild, Tesla's chief designer Franz von Holzhauzen said that there was still more than a year before it would be showing off the rumoured 'Model E'. The name has not been confirmed as official yet, but is widely expected to be adopted by the company. According to Holzhauzen, the Model E will be a similar size to the more expensive Model S, suggesting it will be a saloon. However, he said the car will have a distinct design that would mark it out from the Model S.
The car has been designed as an electric vehicle for the US masses, with a battery range estimated to be around 200 miles. By comparison, the Model S has a range of around 250 miles. 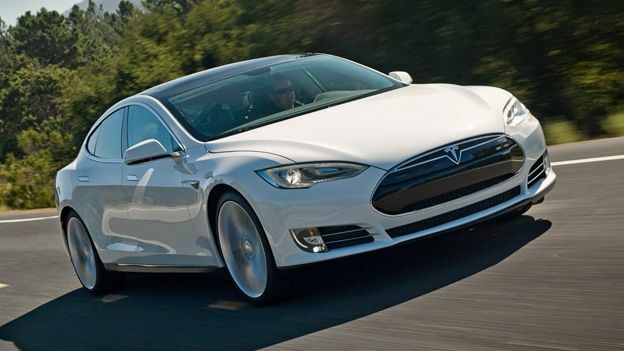 The electric car maker's cheapest model at the moment is the $69,000 Model S. Its price starts from £49,900 in the UK. It is thought the Model E will cost closer to $30,000 (£18,400) after tax credits in the US. No UK price has been mentioned, though going on the increase on the US price, we'd estimate it to be around £24,990. Not exactly budget, but more in the range of the average family saloon. Before it unveils the Model E, the car maker will launch its Model X luxury SUV. That is expected to be made available in the US later this year. It is unclear if it will be making its way over to the UK. You can check out our hands on review of the Tesla Model S in the video below.